Slower job growth for specialists as the health-care system in some cases substitutes other health professionals such as nurse practitioners and physician assistants for physicians. Established specialists may also be reluctant to share resources such as operating room time. Lack of adequate career counselling and personal choices about type and location of practice when new graduates have family responsibilities (spousal employment, caring for children or elderly parents) that make it harder to move to job opportunities. Half of respondents in 2012 said they hadn’t received any careercounselling. Dr. Christine Herman is a recently trained cardiac surgeon. She is like about 31 per cent of new specialists who said they chose not to enter the job market but instead pursued more training, which they hoped would make them more employable. Herman said medical schools and the provinces and territories need to do a better job of workforce planning. “I think that the training programs aren’t in sync with the needs that are out there,” Herman said. “Long-term planning, committee planning for job availability is needed.” Steven Lewis, a health policy consultant based in Saskatchewan who was not involved in the study, thinks the situation willworsen. “I think that there is no question that … almost doubling medical school enrolments since the late 1990s combined with easier paths to licensure for international medical grads was the wrong thing to do. We didn’t think it through as a country.” Just under 20 per cent of recently certified specialists said they’d look for work outside of Canada, which could promote a “brain drain” to the U.S., the report’s authors said. Dr.
Others argue there is a disconnect between the divvying up at medical schools of specialty training positions, called residencies, and the real-world patient demand for the graduates various services. The Royal College of Physicians and Surgeons which oversees and sets standards for medical specialties has already catalogued a list of high-unemployment specialties. It includes not only oncology and orthopedics but cardiac surgery, nephrology, neurosurgery, plastic surgery, otolaryngology the ear, nose and throat field and public health and preventive medicine. We thought, Wow, this is a really surprising list, said Danielle Frechette, the colleges health-policy director. Its paradoxical to have ongoing issues with wait times and cancelled surgeries and able-and-willing bodies to meet those unmet needs (who cant find work). The Royal College is currently surveying recently graduated residents on the issue and has so far discovered that one in five have failed to find full-time work, prompting them to take locums temporary fill-in jobs for absent doctors work part time, or return for further, sub-specialty training. Half the 1,500 respondents to a recent survey by the residents association reported they were moderately to extremely concerned about finding work, said Dr. Adam Kaufman, president of the Canadian Association of Interns and Residents. The group has even started a program, Transition into Practice Service (TIPS) to help get positions for newly trained specialists. Of 35 doctors who recently completed training in radiation oncology, only a handful have found jobs in Canada and three have already left for the United States, said Dr. Loewen. During a typical TIPS session at Queens University in Kingston, Ont., one pathology trainee said he had already been told there would be no positions in the province when he finished next year, said Bryan MacLean, a project manager with the program. Yet a national shortage of pathologists, resulting in heavy caseloads, is often blamed for the slew of scandals that have cropped up in recent years over mistakes in cancer diagnoses and child-death investigations. In another province, a health minister actually told a meeting of student doctors last year when you finish your training, dont expect there to be a job, said Mr. MacLean. But if you are among the legions who have waited more than 18 months for a new hip, a year for a knee replacement or 600 days for so-called delayed breast reconstruction surgery, the study makes no sense. Patients are told quite often that one of the recurring reasons for long waits for treatment is that there are not enough specialist physicians to carry the patient load. 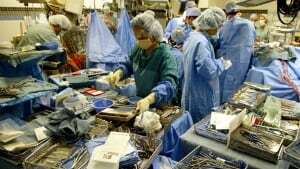 In Ottawa, for instance, one area that has long waiting lists is neurosurgery, and one of the key reasons is that there are just too many patients for too few specialists. So how is it, many people will wonder, that patients will wait two years or more just to see any number of specialists for consultation a let alone surgery a because there are not many of them to go around, And then read a survey saying many specialists coming out of medical school canat find work? Dr. Chris Simpson is Queenas Universityas chief of cardiology and chair of the Wait Time Alliance, an association of 14 medical and surgical specialty societies dedicated to reducing wait times. He says the Royal College survey has a significant bearing on wait times, and acknowledges that many people will compare their own life experiences to the survey results, and find the whole thing absurd. aWhat a lot of people will say is awhat are you talking about?a My father has waited two years for his knee replacement, so how can you possibly have unemployed orthopedic surgeons?a Simpson says. aIt ties the wait times problem with the health human resources problem and the resources issue.a Simpson, who is also the president-elect of the Canadian Medical Association, says the Royal College study reveals the conundrum at the heart of the wait times problem. People wait a long time for treatment not only because there are often few specialists to go around, but more crucially because the resources the specialists need to complete the treatment cycle are not available. For surgeons in particular, the problem is operating room time. Simpson says a careful examination of the study shows that most of the new specialists who canat find work are in fields where hospital resources are needed but not available.